Mobile devices are the 'it' technology, and everyone wants to know how to apply them to their environments. 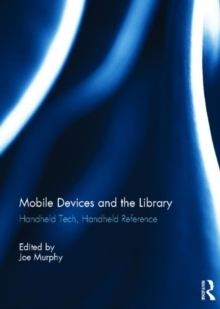 This book brings together the best examples and insights for implementing mobile technology in libraries. Chapters cover a wide variety of the most important tools and procedures from developing applications to marketing and augmented reality. Readers of this volume will get complete and timely knowledge of library applications for handheld devices. The Handheld Librarian conferences have been a centrepiece of learning about how to apply mobile technologies to library services and collections as well as a forum for sharing examples and lessons learned. The conferences have brought our profession forward into the trend and kept us up to date with ongoing advances. This volume brings together the best from that rich story and presents librarians with the basic information they need to successfully make the case for and implement programs leveraging mobile devices in their libraries. Authors of the diverse practical and well researched pieces originate in all types of libraries and segments of the profession. This wide representation ensures that front line librarians, library administrators, systems staff, even library professors will find this volume perfectly geared for their needs. This book was published as a special issue of The Reference Librarian.